Last year I picked up pictures books and I've gotten to appreciate them much more than I did as a child. I hope to continue read and review them in the future. 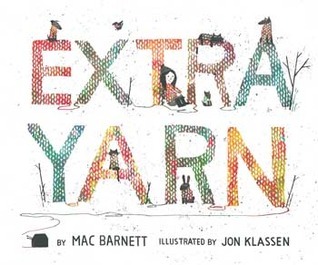 Extra Yarn by Mar Barnett, One Cool Friend by Toni Buzzeo, and Sleep like a tiger by Mary Logue are all 2013 Caldecott honorees. I enjoyed all of these great titles. 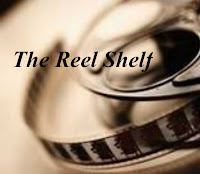 Description: With a supply of yarn that never runs out, Annabelle knits for everyone and everything in town until an evil archduke decides he wants the yarn for himself. Review: Annabelle lives in a dull and colorless town. To occupy her time, she knits courtesy of a gift of yarn she received. She begins to knit herself a sweater and then one for her dog. Everywhere Annabelle went she was mocked and found adversity, but instead of whining or getting angry, she simply made things out of yarn for her adversaries, bringing color, warmth, and happiness. The news of this famous yarn made its way to an evil archduke who tries to buy the yarn from Annabelle with lots of money, but to his shock Annabelle refuses. What happens next brought a smile to my face. I loved how this book illustrated peaceful tolerance. the little girl went, she met with scorn and adversity, but she unwaveringly persisted, always with a contented smile. Readers familiar with Jon Klassen's illustrations will recognize some familiar characters. Overall, this is a simple, odd but charming and magical story that is sure to please everyone. Description: Elliot, a very proper young man, feels a kinship with the penguins at the aquarium and wants to take one home with him. Review: Elliot is a very proper young man, impeccably dressed, formal, and polite. Elliot wasn't particularly thrilled when his father suggested they go to Family Fun Day at the aquarium because it would be filled with too many noisy kids, but he smiled and agreed. At the aquarium Elliot explored while his father sat and read a magazine. Elliott avoided the crowded areas of the museum and found his way to the Magellanic penguins. He liked their proper posture and precise black and white markings. Elliot asked his father for permission to buy a penguin. His oblivious father and him money thinking his son would want a plush penguin that is on sale. Elliot, of course, had other plans and grabbed the smallest penguin, named him Magellan, and popped him into his little red backpack. What ensues is a hilarious and tongue-in cheek story. One Cool Friend is split between the amusing narrative and dry, tongue-in-cheek dialogue between Elliot and his seemingly oblivious father. Though kids may be annoyed with Elliott's manners, they will sense some kinship with his smart and mischievous plans. Dialogue is printed in line with the rest of the text, but is cleverly encapsulated in speech bubbles, which ties the illustrations neatly. Small’s hand drawn illustrations that use pen and ink, ink wash, watercolor, and color pencil are based in crisp black and white, with accents of icy blue, vibrant red, and a tortoise-y plaid. There are also many small details that foreshadow Elliot’s father’s hilarious revelation at the conclusion of the book, something that I missed the first time I read the book but later realized after flipping back a few pages. Hiliarious and heart felt, this picture book is sure to delight many readers. Description: At bedtime a young girl asks "Does everything in the world go to sleep?" The narrative flows well as the mood becomes increasingly tranquil. Though there is quite a lot of dialogue in the first portion of the story, they are realistic and reiterated later by the child. The illustrations in this book are really interesting as it seems the illustrator used digital pictures along with paintings to present her characters. I also liked how the family and the various animals are depicted as royalty. The illustrator also incorporates many patterns into the characters' clothing, rooms, blankets, and pillows. Sleep like a tiger is a a beautiful, warm, and soothing read. Some fun picks up there for kids. I am especially curious about the yarn book it sounds colorful and fun but I like the message as well. Thanks for sharing! Will have to check out these books... especially Sleep Like a Tiger. Sounds cute and looks great. One Cool Friend sounds so good. I loved 365 Penguins and have read it a lot over the years. I might have to get One Cool Friend to go along with my penguin books. Great reviews!! Okay, I really want to read One Cool Friend. It sounds adorable! But all three sound really cute!